As a child Ash Routen had always wanted to be an adventurer or high altitude mountaineer. His love of icy landscapes has recently led him to walk across the world’s largest frozen lake. Get his tips on how you can make your outdoor ambitions come alive. 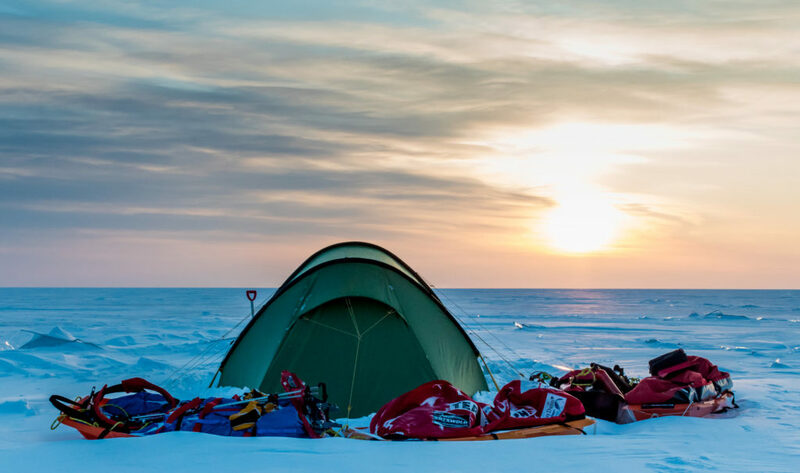 If you’ve always wanted to follow in the footsteps of your heroes – polar explorers like Scott, Shackleton and Amundsen pitting themselves against the harshest climates on earth – and see if you’re up to the challenge, where do you start? Dr Ash Routen, a University exercise scientist and cold environment lover, decided he would walk across the world’s largest frozen lake – Lake Baikal in Russia. He talked to Land Rover Explore about his fascination with arctic conditions, , how he planned the expedition, and the highs and lows of his incredible adventure. A keen outdoorsman, Ash’s renewed interest in all things icy was prompted by a present from his girlfriend in 2015. The gift – a book about geologist Sir Douglas Mawson’s fateful 1913 Antarctic expedition – made him wish he could experience some of those landscapes and conditions for himself. He was inspired by the physical strength, psychological grit and navigation skills that allowed Mawson to not only survive and return to base – despite plunging into a crevasse, running out of food and suffering serious health issues after his two companions perished. It made Ash wonder how he would cope in similar circumstances and if he could match the mettle of his heroes. But most of all, he wanted to experience those boundless landscapes for himself. So Ash became creative. He started looking at alternatives that could fit around his job. Amazing frozen places that wouldn’t compromise his expedition threshold – “I wanted to go to somewhere of comparable difficulty to the poles,” he explained. To learn the ropes, he first went up to Arctic Norway in February 2016, on a short, guided expedition to the Finnmark Plateau. Here he gained some of the additional skills and experience needed to deal with cold weather environments, from expert guide Mike Thornewill. Experience bagged, Ash wanted to see if he had learned enough to cope alone in the environment. So in 2017 he tested himself further, with a week-long solo ski trip across the Hardangervidda plateau, north west of Oslo – a recognised training ground for polar expeditions. The site of one of Norway’s largest glaciers only whetted his appetite for more. For his next challenge, Ash wanted to ramp up the endurance aspects with a longer trip. He weighed up a number of options – logistics dictated it was somewhere that didn’t need expensive travel to get to the start – but he still felt the need to push his own limits. Ash did his research, read a lot, pored over satellite maps, and reached out for help from the outdoor and adventure community, about ice route options that would work for the time he had available. He finally settled on Lake Baikal in Siberia – the world’s oldest, largest and deepest, natural freshwater lake. It’s so big, it’s estimated to hold 22% of the earth’s fresh water. Decision made, he knew that success or failure depended on good planning so spent the next 2-3 months ironing out the details. He found a companion for his journey – Phil Sturgeon, a plumber who had also been on his earlier guided Norway trip. Despite a 20-year age difference, the two got on really well together. Knowing he could count on Phil reassured Ash that they would be able to pull together as a team on the trip, if conditions demanded. The 30-day maximum stay on their visas dictated the starting point as somewhere close to transport access – so the epic journey started in Listvyanka, close to Irkutsk. The pair felt they couldn’t risk starting from the very tip of the lake in case it took too long. They were especially worried about potentially overstaying their visa – the chill between the UK and Russian governments in early 2018 could make things really difficult for them if they didn’t leave promptly. From Listvyanka they walked along the western coast of the lake, before negotiating Olkhon island, and finishing in Severobaikalsk at the top of the lake. At 634 km long, the route is roughly equivalent to walking from London to Edinburgh, or doing 15 back-to-back marathons. The pair often didn’t walk together because of their different stride patterns and speeds, with Ash usually setting off earlier and Phil catching him up. One day, after spending the night in a hut rather than a tent (which Phil would pack up before starting after Ash), he was wondering where Phil had got to. When they eventually met up, Phil reported that there had been a bear wandering around the hut, so he’d been told he had to wait to leave until local rangers scared it off with gunfire. Ice isn’t always smooth and shiny, so Ash and Phil had to contend with various terrain, including snow on ice, ice rubble – where blocks of ice push up against one another – and areas closer to shore with cracking and melting ice. At the start of the trip, this had the potential to be unnerving, particularly lying in your tent at night when your imagination can run riot. But Ash says, “you eventually get habituated to the noises and sleep well”. Both Ash and Phil pulled two sledges each to carry their gear and around 80kg of supplies. They needed to consume around 5,000 calories a day to sustain their trek. Days started with porridge for breakfast and dehydrated food for dinner – interspersed throughout the day with snacks like chocolate, cheese and oatcakes. With limited funds, Ash saved where he could,but he did wish he had spent a bit more on his boots. The lining fell apart in the first week, and after 17 days his left boot was coming apart at the seams. Among Ash’s kit was the Land Rover Explore phone, and he was impressed with its usefulness. His SLR would ice up in under 5 minutes, so he had to be quick to get any shots. But he could keep the Explore phone in his pocket and take photos whenever he wanted. With light use of the camera, video and ViewRanger app, the battery lasted for 6 days – significantly longer than his companion’s iPhone – which seemed to last around a day. The Explore phone battery also lasted longer than Ash’s hand-held GPS. Next time he’ll be debating whether to leave the extra weight of the GPS device at home, in favour of the Land Rover Explore phone. What convinced him of the phone’s durability most of all was the fact that it suffered no ill effects from the extreme conditions, even after he accidentally left it in the awning of his tent overnight. Why tackle this kind of physical challenge? So how do you go from being a keen walker and university lecturer, to polar adventurer? Well it helps that Ash’s PhD is in Physical Activity and Public Health. In his day job, he’s really keen on encouraging primary school pupils to move more. Growing up, he joined the Scouts and loved spending time outdoors. He went on to do a degree in Exercise and Sport Sciences. As well as walking, he’s cycled the length of France. Ash particularly likes the physical challenge of polar conditions – with the purity of testing his capabilities in extreme environments – without all the technicalities of climbing, for example. Knowing he would be walking 25-42 kilometres a day pulling a sledge, Ash trained by pulling car tyres in muddy fields. You get used to it, he says, but you really feel it in your hip flexors. It just goes to show that if you’re determined enough, you can become fit enough for this kind of challenge. But, says Ash, when the temperature goes down to -35°C, and you’re pulling a sledge, “you need to be comfortable with being uncomfortable.” Not washing, wearing the same base layer for 10 days, needing to wee into a bottle, eating dehydrated rations and enduring the sheer grind of walking in freezing temperatures for 19 consecutive days are just some of the challenges to contend with on this kind of expedition. Being physically fit enough to complete the trip is just one part of the epic journey. Plenty of mental strength is needed too – the drive, the coping mechanisms and the never-giving-up mentality are all essential for success. There were plenty of highs and a few lows for Ash on his expedition. The worst part of the trip was around day 9, when he had blisters on every toe and the start of trench foot. “It was like walking on a bed of needles,” he says. But at no point did he consider giving up. Painkillers, taped feet and changing socks got him through. His scariest moment came as he was resting close to a natural break in the ice and heard loud cracking and large blocks of ice collapsed into the water nearby. He suddenly had a vision of the ice sheet giving way under him and quickly scarpered to safety. Even as he worried that he might be plunged into the frigid water below, he thought logically and resourcefully enough to leave the heavy sledge behind to minimise the risk of further cracking from its weight. He waited the cracking out, then when he was sure the danger had passed went and retrieved his kit. He modestly made light of the potential dangers when talking about the trip. Towards the end of the trip there was one magical day, as he was walking, coping with the conditions and taking in the views, Ash couldn’t help but think: “I doubt if I’ll ever get a better day outdoors than this.” You only have to look at some of his photos to get a sense of the impressive scenery, but being so in tune with the environment is something you can only experience first-hand. Another highlight for Ash was the warm welcome from local people. Before the trip, he and Phil were warned that there might be trouble – they could be harassed and their equipment stolen. But they found everyone they came across to be really warm and generous. Many people made the clasped hand gestures that mean friendship as they didn’t have a common language. There was one day when a truck driver stopped and pulled over. This set his alarm bells ringing. What did he want? Was I in any danger? What Ash found instead was the hand of friendship as the driver then companionably plied him with shots of vodka before he drove off again. By the end of the trip he says he physically had never felt better. 10 hours of exercise combined with 10 hours of sun and 8 hours of sleep helped. The pair had managed the trip in just 19 days when they had allowed for 21-22 days. Finishing was a mix of relief and wanting to go on longer. So, what is the effect of finishing such a momentous journey? Ash says he was “pleased and proud” of what they were able to achieve. He feels that his comfort zone has shifted and he now has more confidence in his abilities, to face whatever challenges come his way. This new-found confidence isn’t just in his personal life – he’s found himself speaking up more and being more assertive into the workplace too. Seek advice from the outdoors community – people are very friendly and willing to share their experience and expertise. Have a can-do attitude – be positive, resolute and determined, even when others try to put you off. Invest time in planning – work out the best available equipment, where you can save, and where you shouldn’t scrimp. Knowing what he’s capable of, Ash is already thinking he’d like to do another trip – work, finances and family permitting. And a new pair of boots is on his shopping list. He’s looking at other frozen lakes that no Brits have tackled and other remote places where there are new routes to be explored. He’s also been talking to Scout groups and school children to inspire and encourage the next generation to get out into the wild.